My wife graduated from a four year nursing school with over $80,000 of debt. It stunk, but at that point it was what it was. We had to deal with the debt. We worked hard and paid that debt off in full over the next three years. While most people would think we’d prefer she never had the debt, we’re actually grateful she did. The act of us paying off over $80,000 of student loan debt in less than three years taught us more financial lessons than you could imagine. What’s even better is the fact that we learned those lessons at one of the best times, just as we were starting our professional post college lives. The only better time to learn would have been before college. Of course, then we probably wouldn’t have taken the lessons as seriously as we do now. Living through paying off the debt gives you more perspective. So, what did we learn that permanently changed our lives for the better? 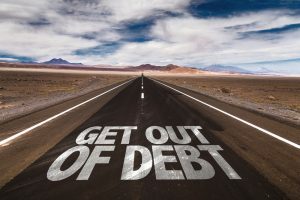 While I was a bit of a personal finance nerd before my wife graduated with $80,000 of student loan debt, the massive amount of debt that faced us caused us to learn everything we could about personal finance. I read personal finance books, personal finance blogs and anything else that could help us set ourselves up for financial success and pay down the student loan debt faster. I probably would have still read about personal finance even if my wife didn’t have the debt, but the debt caused me to dig deeper than I think I would have otherwise. This knowledge has helped us greatly even after paying off the debt. We’re in a much stronger financial position today because of what we learned. When you’re trying to pay off $80,000 of loans as fast as possible, figuring out what is a need and what is a want becomes a bit easier. While many people struggle defining where needs stop and wants begin, we gave a lot of thought to that exact problem. My wife and I decided up front that we’d each get $50 per paycheck to spend on whatever we wanted. After that, we’d try our best to avoid spending money on wants and simply focus on our needs. Any extra money would be used to pay off the loan as fast as possible. We took things a bit further and broke our needs down more than most people would. Yes, we needed housing, but we did not need a huge home. So, we bought a smaller two bedroom townhouse that fit our needs perfectly. It lowered our housing payment by hundreds of dollars over the four bedroom house we had previously been renting. Rather than upgrade our cars, we stuck with the paid off cars we had in the driveway. Even though we’d love to drive a fancy luxury car, our foreign made sedan and hatchback provided more than enough transportation for what we needed. 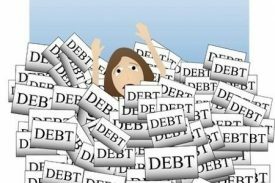 If you want to get serious about paying down your debt, you must go further than needs versus wants. You must determine when an item crosses from the needed utility to the nicer want. One thing we quickly picked up on was the need to budget while paying off debt. In retrospect, I’d say we didn’t use a budget in the strictest sense of the word. That said, we ruthlessly tracked our spending and avoided any purchases we didn’t truly need. In the beginning, I actually set up multiple bank accounts with an online bank to create a virtual cash envelope budgeting system. If we didn’t have the money in the account to make the purchase, we waited until we did. Sometimes it was painful to wait until we had enough fun money available to purchase what we wanted, but it paid off in the end when we paid the debt off in under three years. When we first started paying off the debt, we figured it would take much longer than three years. However, budgeting, ruthlessly tracking our spending and not making purchases we couldn’t pay for in cash helped us pay off the debt faster than we ever could have imagined. When we first started paying off my wife’s debt, we tried to save money wherever possible. Doing so taught us an expensive lesson. Just because something is cheaper doesn’t mean you’re actually saving money. In fact, many times buying the cheaper item cost us more in the long run. Whether the cheaper item broke faster than a more expensive version would have or we simply got tired of dealing with the issues of the cheaper items, we realized paying a little more money for a quality product is often worth the money in the long run. Which would you rather do, buy a cheap $3.00 can opener once every three months or buy a quality can opener for $15.00 and replace it once every five years? If you’re making the long run choice, the more expensive can opener is the clear winner. Making choices like this helped us use more of our money toward paying off debt and less of our money for replacing cheap items. When you have over $80,000 of student loan debt, it looms over your life like the rain cloud that follows cartoon characters. It is a weight on your back that you never want to relive. We’re glad we learned this lesson early. After paying off $80,000 in just three years, we realized the sacrifice it takes to get rid of debt. Debt only exists to help you buy things you can’t afford today. Your future self is the one that pays the price. While there are some purchases you can’t reasonably afford to pay cash for early in life, mainly a house and your first car, you should be able to pay cash for most everything else. If we can’t pay cash for something, we simply don’t buy it. In fact, we recently bought a brand new minivan. We saved up enough cash to pay for it before we made the purchase. We don’t want to owe anyone money when we don’t have to. We’d rather deal with the alternatives. Most people don’t start investing as soon as they get their first job. My wife and I did. Why? We didn’t want to get behind when it came to investing for our future and retirement even though we had $80,000 of student loan debt. While we didn’t contribute much, we made sure to at least contribute enough to get the full 401(k) matching contributions offered by our employers. After all, you can’t beat the 100 percent return on investment they were offering. After the student loan debt was paid off, we knew we needed to get serious about investing. Since we were no longer making massive student loan debt payments every month, we used some of that money to help fund an emergency fund and to bolster our investment accounts. My wife and I both contributed to Roth IRAs. In addition, we contributed to our retirement plans at our workplaces after we paid off the debt. Without the student loan debt, I don’t know if we would have learned as much about investing as we know now. Learning about investing early has blessed us with the opportunity to use as much time as possible to help our returns grow through the wonderful process of compounding. Starting just a few years earlier, thanks to the student loan debt, could easily pay off to the tunes of thousands or tens of thousands of dollars in retirement. If you asked my wife and I at her college graduation if her student loan debt would be paid off in full less three years from that day, we’d say no way. However, with a bit of planning and a lot of hard work, that’s exactly what happened. We now realize that anything, within reason, is possible when you put your mind to it. How did we do it? My wife and I cut back our expenses as much as we realistically could. That’s not all, we also worked hard by earning extra money along the way. We put all of the extra money toward paying off the debt and conquered it in less than three years. We were amazed, but it just goes to show you even crazy financial feats are possible. Did we hit some lucky breaks along the way? Of course! However, we also had our fair share of major speed bumps including two short term disability stints for my wife. Looking back on those three years of paying off $80,000 of student loans, we definitely wouldn’t change a thing. I’m glad she had the student loan debt. We learned all of the above valuable financial lessons and even more. It brought us together as a couple to vanquish a common enemy and strengthened our bond. We aren’t proud of the debt itself. Instead, we’re proud of what we learned throughout the process of paying it off. The knowledge has changed our lives permanently for the better.